Get a FREE coffee table or dining table when you spend $500 and $800 respectively at The Sofa Clearance Sale! 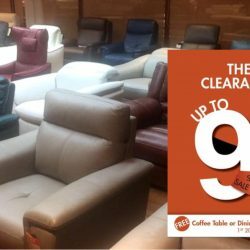 Hurry and visit them now to enjoy discounts as high as 90% off selected sofas! Choose from recliner sofa to 2 seater, 3 seater, L-shaped, armchairs and more.. In both leather and fabric upholstery. 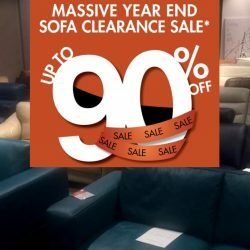 Missed out on Sofa Outlet's clearance sale over the weekend? 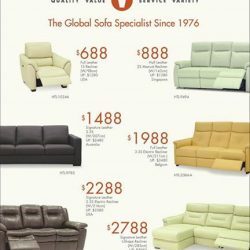 Fret not as they still have many more sofa designs for you to choose from at their massive year end warehouse clearance sale! Enjoy up to 90% off on their sofas from now till 23 December 2016! 2 DAYS ONLY FACEBOOK EXCLUSIVE! ENJOY UP TO 45%* OFF SELECTED MODELS! Promotion last from 3RD - 4TH September 2016. 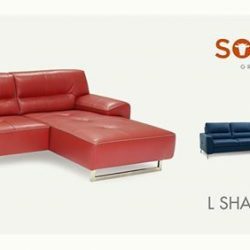 Take this great opportunity to own a brand new top grain leather sofa from #SofaOutlet ! It’s now or never! All sofas must go! Join us this weekend at our #sofaoutlet located @ 11 Gul Circle for the Last, Final and Biggest Sofa Sale Ever! Receive a free gift from us when you make any sofa purchase during the event, while stocks last! Hop on to our two-way FREE shuttle bus service located at Jurong East (Venture Avenue) that takes you to Gul Circle! 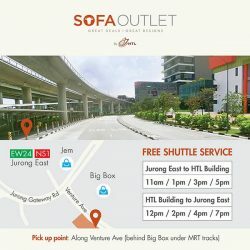 Look out for the shutter bus signage with our Sofa Outlet logo. We are back due to popular demand! More than 800 sets of sofas were sold over our May GSS sale, so we are adding more sofa models for your selection! With over 3000 models to choose from, this is the perfect opportunity to get a top quality leather sofa for your home. So mark your calendar for the return of The Biggest and Largest Sofa Sale Ever and join us at #SofaOutlet located @ 11 Gul Circle! Share this fantastic news with all your friends and family so that everyone can enjoy this awesome sale!